Most dog trainers would include a crate like this one on their list of dog owner must-haves. Crates speed up housebreaking because dogs generally won’t soil their own “den.” It also keeps peace in multi-animal households, helps dogs rest after surgery or illness, and keeps them from being destructive when they’re home alone. Though most people start crating their dog while they are still a puppy, I wanted to try crate-training with Cow at four years old. Though she’s never destructive and doesn’t have potty accidents, I wanted her to learn to enjoy being contained in case we ever travel with her, or she has to stay overnight at the vet’s. Actually, the biggest reason I wanted to crate-train Cow was because she loves sleeping with me and Matilda in my twin-sized bed. In order to dissuade the guilt I’d feel from kicking her out of bed, I wanted to make sure her crate was, to her, a castle. 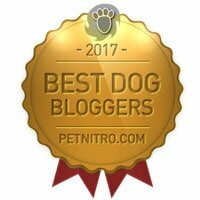 Disclaimer: I received a dog crate and compensation in exchange for my review. 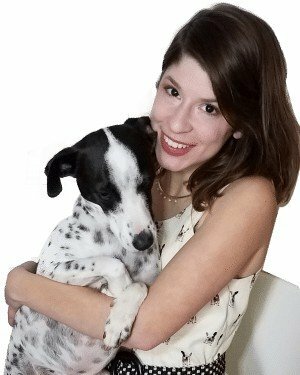 I only feature products that me, Matilda and Cow absolutely love! The Intermediate sized crate is for dogs up to 30″ long and 23″ tall, which is roomy for Cow. When choosing a crate size for a puppy, select one that will suit them for their entire life. This crate comes with a divider so you can make the interior smaller. Some puppies will soil the empty side if their crate is too big. What I really like about this crate is the side door. When I use it to feed raw meaty bones indoors during the winter, it’ll be so much easier to wipe down without taking the bottom tray out. I also like the dual locks on each door. Though Cow is not an escape artist, the dual locks help keep the door closed in the event that your dog tries to dig their way out. Otherwise, this is your standard wire crate. It folds flat and it’s lightweight so you can bring it along when you travel so your dog’s sleeping quarters will always feel like home, whether you’re at a hotel or grandma’s house. 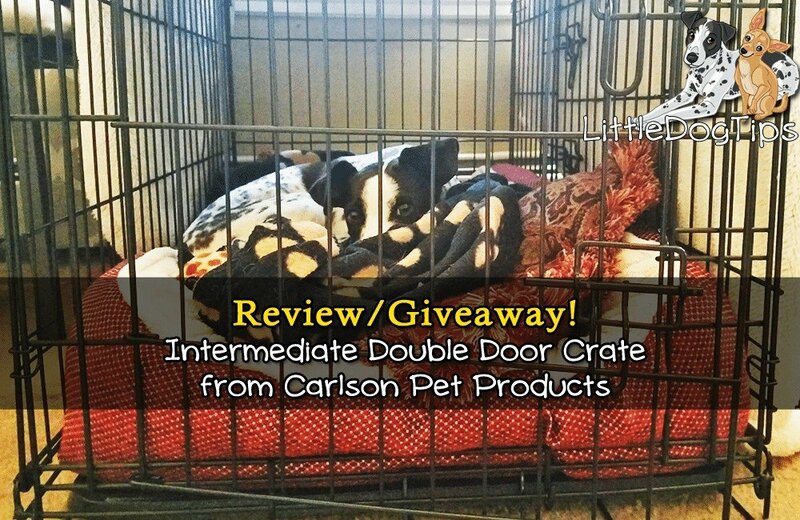 Would I Recommend The Intermediate Double Door Crate from Carlson Pet Products? 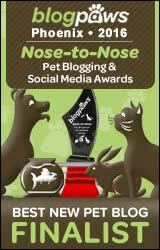 I would suggest this product to anyone bringing home a new dog or puppy, or in need of an upgrade from an older crate. It’s lightweight, so I wouldn’t recommend it to extremely powerful dogs. I also wouldn’t use it in a car – you should use a crash-tested seatbelt harness or carrier for car travel. Ultimately, this crate is a framework for your dog’s happy place. Fill it with blankets, toys, treats, chews, and be sure to build positive associations by keeping it open as often as possible. 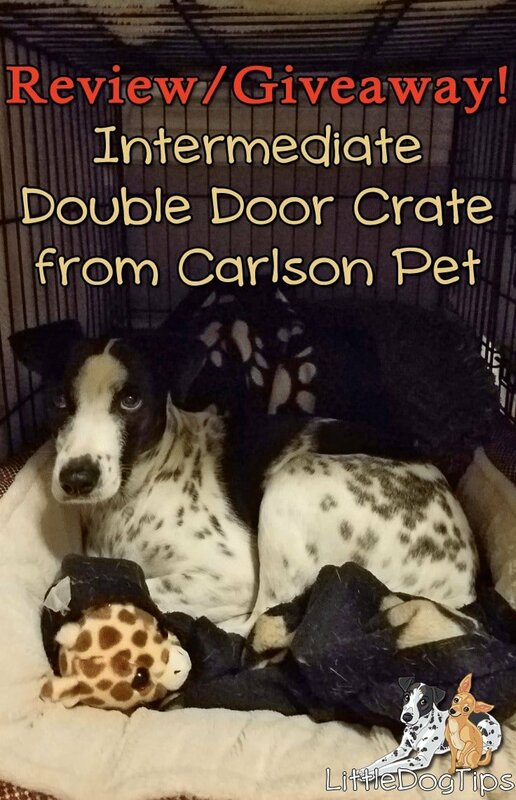 Cow’s intermediate double door crate is furnished with a dog bed, pillows, blankets and toys. She always covers her eyes when I’m working late with the light on, so I draped a blanket over her crate so I can continue burning the midnight oil without disrupting her beauty rest. It really has become her “castle”! Does Your Dog Need A Castle? Shop for this crate and others in many more colors and sizes at Carlson Pet Products. We’re also giving a FREE Intermediate Double Door Crate to one lucky giveaway winner. Must be 18+ to enter, USA only, no purchase necessary. Ends June 22th. I don’t use a dog crate for my Boston terrier as he’s a perfect gentleman. I would like to donate this crate to a Boston Terrier rescue for a foster dog. I do crate my dogs at night, I found even with older dogs once they get use to it, they like it, their safe p?ave or den. I would use this as an update if I win. My dogs are larger and my biggest, my boy, Seiji, has let me know if no uncertain terms that he wants me to leave his crate up. He gets frightened by thunder, fireworks, etc., so it gives him a safe place to lay when that’s happening He also likes to curl up in it when he’s just tired. While the size of crate for this giveaway might not work for my own dogs, it would be PERFECT for when I transport rescue dogs/cats. I need to keep crates of various sizes on hand, but there are times it’s hard to fit what I need into my vehicle. I hate having to pull crates out of my vehicle just to get dogs into them. There have been times when having a second door on a crate would have been a godsend – letting me fit the crate where there is enough room and not having to worry about not being able to access the door. Not to mention, when we have an especially timid dog, having double access could really help in getting an uncooperative pup out of a crate. I would love to have this crate! I have three Boston Terriers, and they use their crate to sleep in or get away from the other dogs! Ours is old and could use a new one. I have a little 6 pound Shorkie named Bella. I’d love to have this for her nap and bedtime. She’s 7 and likes a little alone time away from the kids sometimes. We have a biggish chi (12 pounds) who demands attention and if I forget to close the bathroom door, or to put the bathroom wastebasket up high when we leave her home will knock over the basket amd systematically leave us gifts throughout the house (under covers, between sofa cushions, piece by piece down the hall) We have a crate for her, but it is one of those plastic ones she cannot really see out of so this one would replace it. We have a 5 mo old puppy and have been looking to get her a second kennel – one to keep upstairs for bed and one downstairs for general use! This would be great. This pet crate will be perfect for my dachshund, Scooter. He is only 4 months old, but we need to set limits – he is into everything! I would keep it in the house so he could have his own sleeping space, instead of sleeping on the furniture. I would use it when my dog gets anxious. Also to sleep in or travel with. This would be for our daughter to use when traveling with her dog. I have a new puppy coming and I want her crate trained. I’d use it to corral the little kittens I have when I have to sweep floors and vacuum. . Actually would be great for that too besides dogs. This is very much needed for our dog, Wilson. He’s a coonhound/shepherd/red heeler mix and gets very anxious when we leave. We’ve had the same crate for 3 years and he could really use a new one. This would be wonderful! I’d love to have this for my toy poodle, it would give him more room when he has to be in the crate. I do volunteer work for a rescue group and would use this to transport all different kinds of dogs — mostly pitbulls and mixed breeds of medium size. Tell us about the dog you want to win this crate for – how would you use it? Our girl’s name is Anya. She’s a husky mix. We would use it for her when we are away from the home. She’s good if we just have to run to the grocery store, but if we’re gone for a half day or more, we find surprises when we get home. Stinky ones. i keep my crates in my house for emergencies. i also feed one of my dogs in her crate so that the other dog wont eat her food. i have to put the girls in the crates when i clean and vac because they cant stand the vac cleaner. sometimes i use a crate for a time out. This would came in handy when traveling with my dogs. My mini dach – Pepper is a true escape artist and he is afraid of young children (pitfall of being over ahem 40 and not socializing adequately) We now have a grandson who is 18 months and this crate placed in our bedroom would be a great respite for Pepper from the little guy. (Pepper has a small crate in the great room he is used to resting in during the day and I don’t really want to disrupt that location as he is used to it and it is working. I would use this crate for our Yorkie. He gets very excited when company comes over and sometimes he will try to dash out the door! A crate would be great to keep him contained and safe. I’d love to start crate training my two year old dog khaleesi in case she ever needs to stay overnight being boarded or at the vets so she doesn’t freak out. We have just recently started camping with an RV and we take our Corgi with us. He likes to be outside a lot and there are times when I wish I had a crate that I could have him rest in outside so he wasn’t laying in the dirt. This would be great when traveling with our dog. I have a Chihuahua mix, named Ruby, who gets into things while we are out of the house. It has cost us lots in emergency vet bills. We are looking for a crate for her to rest in and be safe while we are out of the house on short errands. I would live to use this on my 4 yr old Norfolk terrier. Looks wonderful! Has so many options and that’s awesome in my book! This would be great for my boxer as a spare crate. This would be used on trips when I have to leave him alone in a cabin so he doesn’t cause trouble. I have two dogs. My mini doxie, Bowser, needs a slightly bigger crate than he has. I would use this crate, as I’ve used his last for the last almost 3 years. It’s his safe haven when mama’s not home. My dog Myla needs an extra crate. We visit my dad quite often and spend a few nights there and she feels more relaxed when she’s in her crate. I won’t have to constantly pack up her crate from home and bring it back and forth if I had another crate to keep at my dad’s so Myla will be more comfortable. Not sure about the sturdiness of this crate. Seems like the stronger breeds should be able to destroy it. I could use a second crate. My rescue dog that I got a year ago had her own but I also have a senior I would like a crate for when I have to leave. Love the chance to win one. I would love this for my rescue pup! He loves his own den. We just got one 2 weeks ago and it would be great for training. About a month ago, I adopted my best friend. Her name is Prissy. I would use this when we traveled so she would have a place to sleep at relative’s houses. Sadie would like this crate as long as she has her favorite blanket. She’s a border collie mix and likes to nap in boxes or under tables so this would suite her just fine. She also gets nervous and skittish during thunder storms or the fireworks during the July 4th week, so this would give her a secure place to hunker down. This would also come in handy in traveling with pets as we get a number of stray dogs and cats that need to be found homes and taken to the vet. I like the double door. I would use this crate for my little Mia. She likes staying in a box at night so this would be a nice change for her. I would use this crate for my dog when we leave the house. He gets anxiety, and I think this would help him. I could use this for my new puppy. She has anxiety around company and needs a space of her own to feel safe and secure. It would be perfect for my sweet buddy. Thanks for the wonderful opportunity! I have a silky terrier mix who is super cute but when I mop the floors has the annoying habit of running around the house and completely destroying my work lol. I would use this crate to help her have a place to relax alone while I clean the house. I think she would very much like to have a place all to herself as well. Thanks! I would use it for our foster dog that will be arriving soon. My wife is President of St. Louis Samoyed Rescue and they are sweet dogs. This dog crate is nice but it seems i am comfortable to have my dog always beside me. These dog crate is also good for traveling so it’s really useful. The right size of the crate is a very important matter to consider when travelling. This is to ensure our pets comfort and safety. Great share!